The sun is setting and the tall heads of wheat in the field are gently swaying back and forth in the southern warm breeze. You see a row of baskets and clay pots filled with sunflowers and garden vegetables down the center of a long rustic table with bales of hay for seats. The sound of laughter and merriment rises to the level that makes you take a second look as you see a large gathering of friends in the grassy knoll enjoying each other’s company. Then you realize it’s the sweet life celebrating with friends dining in the open air Al Fresco style. Whether your table is set for two or twenty, dining on your patio or in a grassy field next to your garden, your guests at this dinner party will be filled with joy, laughter and fabulous food. As the summer garden winds down sun-ripened tomatoes are in abundance and play a vital role in this dinner party menu. The fine flavors of heirloom and cherry tomatoes makes every dish even dessert one to savor. To set the scene for a relaxing outdoor dinner, a round table for four is set with a casual white table cloth and brown craft paper as runners under each place setting. Assigned seating can be noted with individual names written with a chalk paint pen. At each setting hand-crafted rhododendron leaf placemats serve as the charger for the white dinner plate and solid green napkin fold. Eating utensils are held together in one place inside the simple folded napkin that compliments the living green placemat. As an appetizer and pretty centerpiece, Caprese Galette is served on a large food-safe log slice. The tomato themed rustic tart provides a colorful focus to the table. To help with the ambiance of the evening and to provide soft lighting, glass globes with green peas and tea lights are hanging on branches of a cherry tree. As the sun sets the tree lights up like fireflies in the darkness of a summer night. This table setting is simple décor that looks to nature for inspiration. Grilling and outdoor dining goes hand in hand but at this party all food is made -a-head of time and baked in the oven. The appetizer the Tomato, Basil and Mozzarella Cheese- Caprese is served on top of a baked parmesan cheese filled free form rustic crust. The crust is a mix of flour, cold butter and parmesan cheese rolled into a disc and chilled thirty minutes. The dough is rolled into a thin round circle and filled, leaving one inch around the rim as the crust edge is hand folded over the filling. In this recipe, the crust edge is shaped like half moons with buttery bread crumbs baked inside the crust. After the crust has cooled, sliced tomatoes, snipped basil leaves and fresh mozzarella cheese is placed on top of the baked bread crumbs and drizzled with olive oil. Serving the Galette on a food -safe log slice adds to the rustic presentation. Tomato and Feta Cheese Crostini is served as a complimentary appetizer to the Caprese Galette. A baguette is sliced into half-inch slices, oven toasted and rubbed with pre-roasted garlic cloves before serving. The Crostini is served with two side dishes, diced cherry tomatoes and crumbled feta cheese. Other food items on the menu include Sour Cream Chicken Enchilada Casserole, Caesar Salad and for dessert, French Vanilla Bean Ice Cream with Tomato, Strawberry & Peach topping drizzled with Fig Balsamic Vinegar. The sweetness of the cherry tomatoes with fresh strawberries, blueberries and sliced peaches enhance the fig- infused balsamic with the Vanilla Bean Ice Cream. So simple to serve, place scoops of ice cream into a glass sherbet or parfait dish and freeze until ready to serve. The tomato and other fruits are sliced, diced and drizzled with fig balsamic vinegar and covered to mellow until serving time. Garnish with fresh sliced strawberries, a peach slice and blueberries. 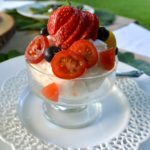 Botanically, tomatoes are a fruit so even though you may not consider mixing tomatoes with berries it is a the perfect balance for sweet and tartness with the fig balsamic over ice cream or Pound cake. Sour Cream Chicken Enchilada Casserole is hearty enough to serve on its own and you could serve this dish with rice as a great side. The Mexican casserole is filled with small corn tortillas cut in half and layered between a creamy white sauce, shredded chicken, Cheddar and Monterey Jack cheese garnished with diced heirloom cherry tomatoes, green onions and parsley sprig. Why not mix Mexican with Italian we mixed tomatoes with peaches and berries over ice cream? The tomato brings all the flavors together in perfect harmony. Boasting health benefits vine -ripened tomatoes are juicy gems from heirlooms to the tiny sweet cherry. The deep red pigment of many tomatoes is caused by the antioxidant Lycopene. Lycopene is known to be beneficial for bone and heart health. Tomatoes also have anti- cancer properties to help reduce inflammation in addition to many other benefits. With the abundance of tomatoes at summer’s end think of creative ways to serve these juicy fruits while improving the health of your family. Can you see it in your mind’s eye? Your table set outside with nature inspired décor and vine-ripped tomato recipes on the menu. Your family and friends laughing and enjoying each other’s company while devouring your garden fresh Tomato -Feta Crostini. Hope you will consider hosting a dinner Al Fresco while the warm summer breezes linger and the fireflies light up the night sky, for this is living the sweet life or la dolce vita! In food processor with steel blade, add flour, salt, garlic powder and butter. Cover and process until pieces are pea-size. Add Parmesan cheese process with on/off turns to combine. Add cold water and olive oil process until dough forms a ball. Remove and flatten dough into a disc. Wrap in plastic wrap and refrigerate for 30 minutes. Meanwhile, slice tomatoes and sprinkle with salt, drain on paper towel. Set aside 30 minutes. On lightly floured surface, roll out chilled dough into a 13” circle. If dough is too wet, roll into a ball and add more flour, roll into a circle. Transfer dough onto baking sheet. Using a large round cookie cutter, cut half moons around edge of crust, remove excess dough. Prepare filling: In microwave glass bowl, melt ¼ -cup butter add bread crumbs, Parmesan cheese and spices. Spread crumb mixture over center of crust. Gently lift edges of crust over the crumbs. Mix egg and water together and brush edges of crust with egg wash.
Bake 30 minutes or until crust is brown and crisp. Remove from oven, cool crust. 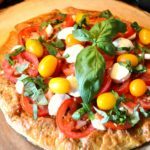 Alternate sliced mozzarella and heirloom tomatoes in circular fashion over baked crust, follow with cherry tomatoes and thinly sliced basil leaves. Drizzle with olive oil before serving. Garnish with basil leaf in center of tart. The crust is delicious! This can be served warm or cold as a main dish or appetizer. Original recipe created for you! Wash and pat dry all fruit and tomatoes. Slice and dice all fruits except blueberries. Place in small bowl and drizzle with fig balsamic. Gently toss to combine, cover with plastic wrap and marinate at room temperature up to 2 hours prior to serving. *Fig Balsamic vinegar can be found at Abingdon Olive Oil Co.